Good morning, everyone! I hope you've got a wonderful weekend ahead of you! 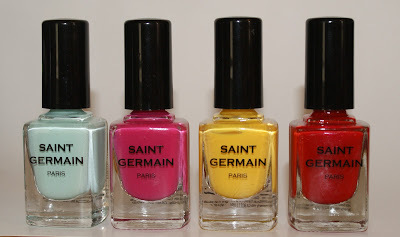 Today, I have nail polishes from a new brand in the cosmetics industry, Saint Germain! From left to right, Sea Green, Pink Lotus, Yellow Sun, and Poppy. These are the brights. Warning: We're about to get pic heavy! First up is Sea Green. I'm beginning to fall in love with shades of mint and this is a beautiful pale mint shade. The application was incredibly smooth for such a pastel color and was opaque in two coats. I love the fact that this is a VERY pastel mint color, almost like the color of a Tiffany's box. 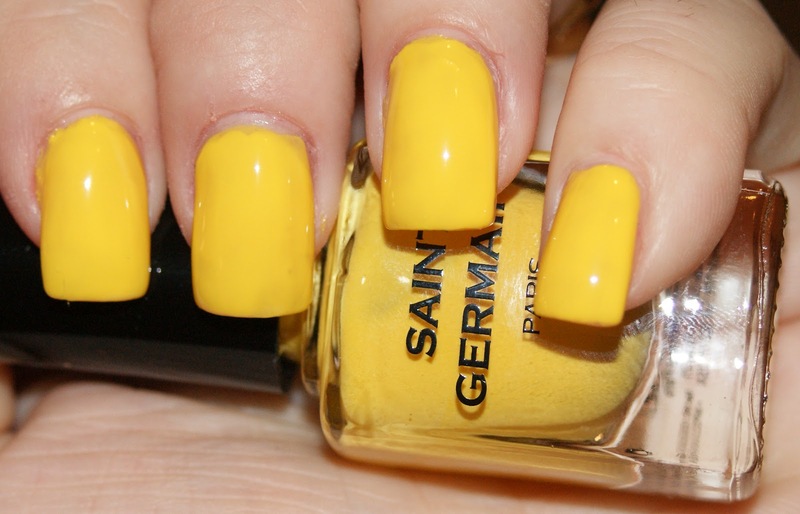 Even the Queen Mum of Polish (aka, my Nana) was dropping dead over this color. That's how you know it's a stunner. 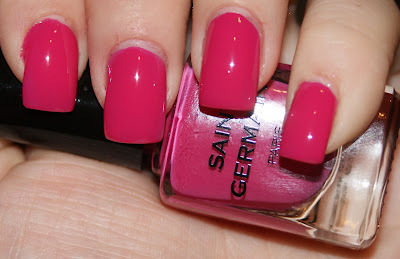 Next is Pink Lotus, a gorgeous magenta creme. Dear God, she is STUNNING. The application was perfect again and opaque in two coats. 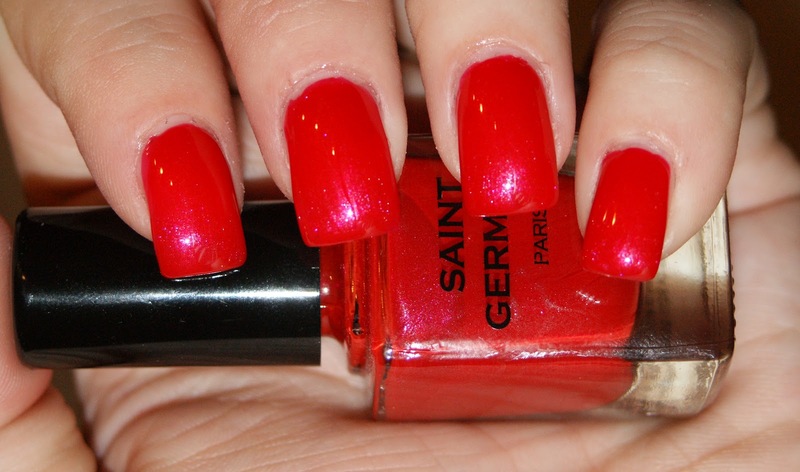 There is ZERO top coat on this polish, but it clearly dries with a beautiful luster. Another polish the Queen Mum wanted to steal! And here is Yellow Sun, a dandelion creme. Yellow Sun was not what I expected on the nails. It was a little lighter than it appears on the bottle, which was really nice because I'm not a huge fan of neons. The application was a little streaky, but evened out for the most part on coat three. A top coat would probably do the final trick. That being said, I'm still keeping her in my stash drawer as I don't have many yellows and she is one of my faves. So much so, I used her for my mani yesterday! Last, but certainly not least, is Poppy. 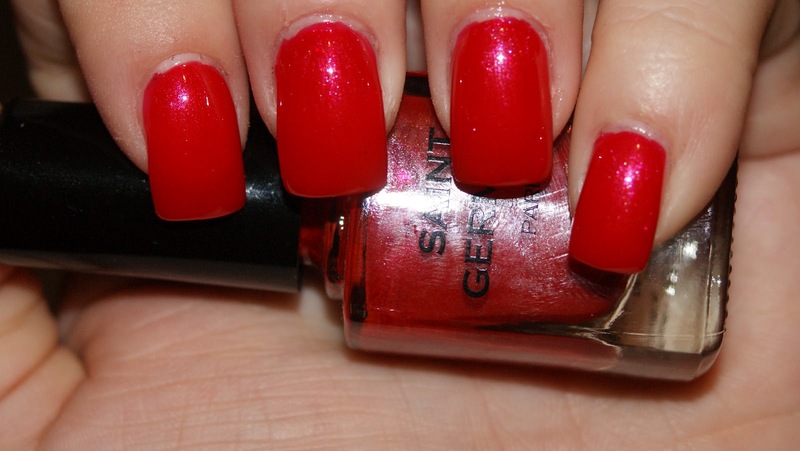 Poppy is a shimmery tomato red that also applied like a dream. This was with two coats and was completely opaque. I'm not the biggest fan of bright reds because I don't like the way they make my skin tone look. I only own one shade of red lipstick, which is a cooler violet/blue-red, as opposed to an orange-red, because it looks nice with my skin. Because of the subtle blue shimmer in Poppy, it is REALLY flattering on me and I LOVE it. I actually wore it for two days. Which for me, is a LONG time. If you click on the picture to make them larger, you'll seethe shimmer better. Overall, I loved the first half of these colors. They're bright and summer, with a little extra something that makes them unique. Best of all, they are highly affordable with quality that surpasses their price points. The retail price of their polishes are $3.95 and right now, on SaintGermainMakeup.com, there is free shipping for orders over $25, or at least 7 polishes! 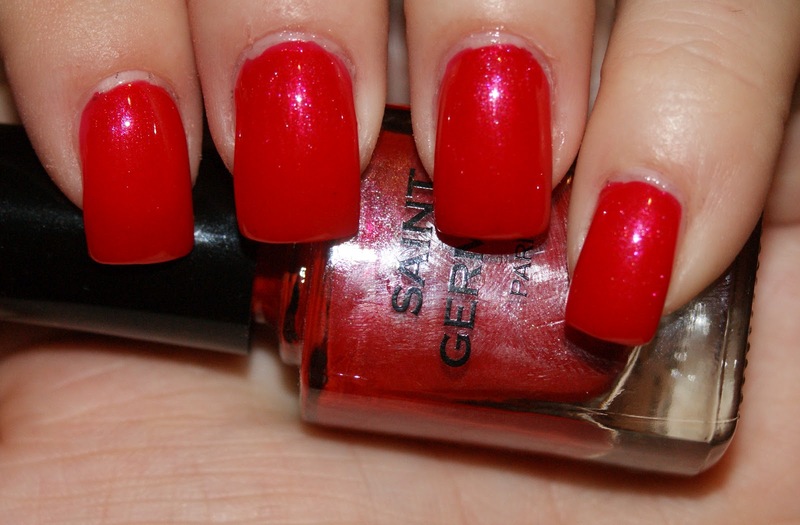 When can you really get seven high quality nail polishes for under $30 these days? And there are currently 22 shades to choose from, as well as cuticle remover, hardener, and other nail care products. 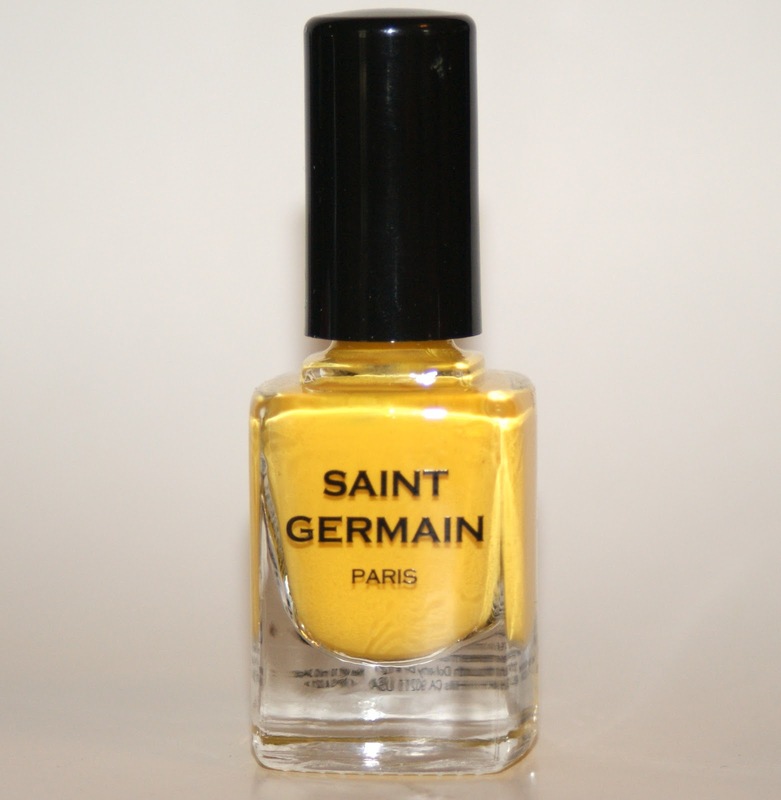 Saint Germain Paris is an affordable cosmetics collection with contemporary design and Parisian sophistication. They blend quality formulas with sleek, French-inspired packaging, which appeals to all ages and income. The initial collection offers a full range of products for face, eyes, lips and nails. Be sure to check out their Facebook page! According to Saint Germain, All products are free of harmful chemicals, formulated for all types of skin, and available in a variety of colors and shades. I can confirm that they are 4-free via the bottle's ingredient list. Retail prices range from $2.85 - $9.95. Will you be joining me aboard the Saint Germain bandwagon? Stay tuned for Part 2, coming soon!